The San Diego Regional Center created many new routes using ArcLogistics Route software. On June 30, 2003, the American Red Cross eliminated its transportation services in San Diego, California, and the San Diego Regional Center (SDRC) was suddenly without buses for half of its clients. "It was a nightmare," says Bernard Arroyo, transportation coordinator, SDRC. "Fifty percent of our capacity was eliminated, and I was very concerned about finding a solution for this problem." SDRC is one of 21 regional centers in California for persons with developmental disabilities. Since its creation in 1969, SDRC has been serving people living within the geographic boundaries of San Diego and Imperial Counties. The center serves as a focal point within the community for those with developmental disabilities and their familiesa venue for these individuals to receive, or be referred to, health, welfare, and education resources. "We had to make do with the limited resources in the community," adds Arroyo, "I knew I would not be able to find one contractor to replace the 47 bus routes the Red Cross operated, but I also thought there was some operational efficiency to be gained if we reevaluated the system." Of the 15,000 people aided by SDRC, 1,000 use the center's private transportation service. The service is contracted out among nine different transportation companies, some of which operate in a different geographic area and may have a particular specialty such as transporting both the medically frail and ambulatory clients. "Our agency has a contract with the state of California to provide these services," says Arroyo, "and although the state doesn't tell us how we should operate, it does expect that we meet the needs of the clients and operate in a cost-effective manner. The center creates the supplementary transportation, or paratransit, routes to avoid overlap by different contractors at the same pickup locations and to better ensure that our consumers are receiving access to programs within their community. We want to keep transit times to a minimum, and we work with many nonprofit companies and smaller companies that just don't provide enough transportation service to warrant the purchase of their own routing software." Prior to July 2002, the center used grid coordinates from a popular series of mapbooks to track the location of each pickup and drop-off point. However, those maps were structured in such a way that one location may have two different coordinates as pages overlap. 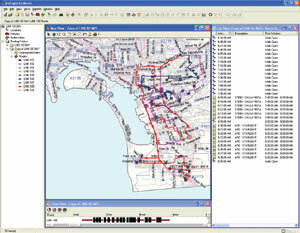 As the need for a more effective routing strategy became apparent, the center received a grant from the California Department of Transportation (Caltrans) and implemented Esri's ArcLogistics Route (customized for the paratransit industry by Infinite Enterprises), ArcView, and the ArcView Network Analyst extension. However, it was during this initial implementation process that the Red Cross eliminated its transportation services. "When the Red Cross gave notice, we used the software to create the new routes that we were going to need," says Arroyo. "We discovered that if we created the new routes, we could then take that information to the contractor and it could acquire the buses that we would need. We increased our productivity by at least 20 percent. Before implementing our new system, we were operating at 4.4 trips per hour, and now we are operating at 5.8 trips per hour. "ArcLogistics Route helped get us out of that predicament of suddenly reduced transportation services. And it worked wonderfully. First, we were able to get a much clearer understanding of how our system was operating. Second, we were able to effectively use the limited resources that were available in the community. In that respect, even if we don't use the software again, it's been well worth the money the agency paid. But now we have to look at how to take this to the next levelgetting our entire SDRC logistical system into the software." For more information, contact Bernard Arroyo, SDRC (e-mail: barroyo@sdrc.org, tel. : 858-576-2969). 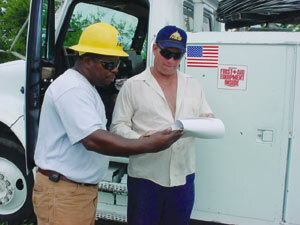 One of the largest public utilities in the country, Nashville Electric Service (NES) distributes energy to more than 329,000 customers in middle Tennessee. The NES service area covers 700 square mileswhich includes all of Davidson County and portions of the six surrounding counties. Responsible for 104,700 streetlights and private lights, NES receives 75 to 100 calls for maintenance per day. 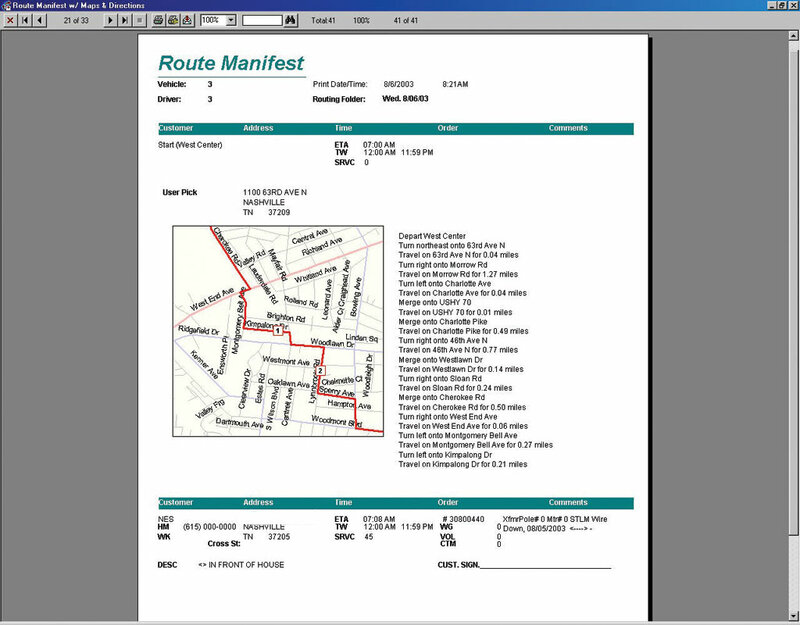 Incorporating maps and driving directions, a printed route manifest of the day's lighting fixture repairs is given to Nashville Electric Service (NES) maintenance crews. "I would download the calls from the main office and print them out," says John Thomas, line supervisor, NES. "I would take all of the calls for the next day and look up all of the addressesand this is in a town the size of Nashville. I would group the calls into areas and then give each crew a sheaf of papers. It was a long, slow process." "We began to have retirements," comments Michael Buri, lighting and attachments supervisor, "and the people who knew the system inside and out were starting to leave. The remaining employees did not have the years of experience to know where each particular light or address was located or the expertise of retiring employees who had worked at NES for 30 or 40 years. "While investigating our options, we performed some trials of ArcLogistics Route," adds Buri, "and it worked with our operations crews and here at headquarters. Based on these trials, we saw that we could get a very good response with minimal input. 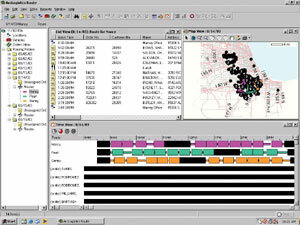 It was a stand-alone application, and we didn't need to have a full-blown GIS. Everything we needed was in the package; all we had to do was enter the addresses we wanted to get to." 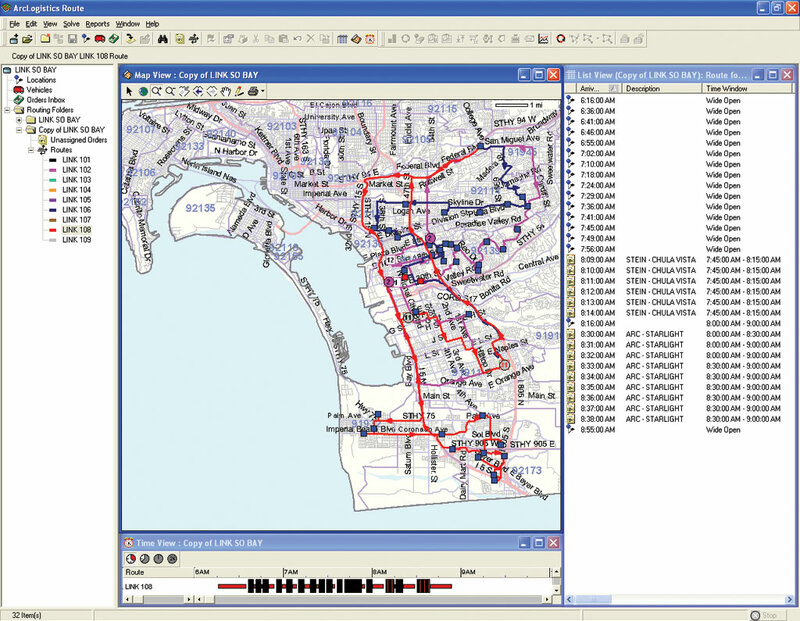 In addition, NES found that it could further support its maintenance crews' need for area knowledge and routing by implementing ArcLogistics Route as an application within its ArcInfo, ArcView, and ArcSDE enterprise GIS. When a customer calls to report that a streetlight or private light is damaged or out, an NES customer service representative adds this information to the customer provision system mainframe. At the end of the workday, this information is processed on the mainframe, transferred into Microsoft Access, and automatically formatted for ArcLogistics Route. "The crews love it," says Thomas. "Not only did it make my job a lot faster and easier, but it also did the same for them. 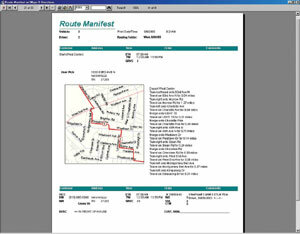 They can look at my cover sheet with the route map, and they know exactly what area of town they're going to. Previously, they had to shuffle through a pile of papers and put all of their calls in order. That would take each crew about an hour every morning, time we're now using to service lights. We have had the program for a year now and have improved the number of lights serviced per day per crew by about 20 to 23 percent." Adds Buri, "ArcLogistics Route has been an out-of-the-box package that has been extremely helpful to us with minimal programming." For more information, contact Michael Buri, NES (tel. : 615-747-3687). Assigning inspections based on priority and location allows HACC to keep these assessments properly organized while increasing daily totals. It is a word problem that would make any math student blink. How do you schedule more than 25,000 inspections per year in the most efficient manner while avoiding multiple trips to the same building or street for different tenants? Until 2002, the solution to this conundrum involved a great deal of time, frustration, and highlighters for the Housing Authority of the County of Cook (HACC). Dwight Fenderson, deputy director, Rent Assistance Division, HACC, says, "Supervisors would scan down reports of inspections with a ruler and a highlighter and highlight related houses, then manually assign these inspections to their staff. It was an extremely tedious job for supervisors when we had so many other things we needed them to do." HACC is responsible for the entire area of Cook County outside the city of Chicago and operates a Housing Choice Voucher rental subsidy program for low- and moderate-income families. The U.S. Department of Housing and Urban Development (HUD) requires that each of these units be inspected before they come under lease and annually each year thereafter. Complaint inspections and random quality control inspections must also be performed. With 13,000 active units, HACC needed a clearer way to track units that had failed inspections and required follow-up. "A lot of these units fail the initial inspection, so we have to go back sometimes two or three times before we can approve them," adds Fenderson. A housing inspector of the Housing Authority of the County of Cook (HACC) checks her day's inspections. To untangle the task of organizing and cataloging these inspections, HACC implemented ArcLogistics Route to automate inspection routing. "I think we achieved what we set out to do," continues Fenderson. "Each inspector does 33 percent more inspections, mileage payments have dropped by at least this amount, and in one-half hour supervisors can schedule inspections that previously would have taken them most of the day." To increase the database capacity of ArcLogistics Route and to make the system simpler for its inspection supervisors to operate, HACC worked with Chicago-based Esri Business Partner Truck Dispatching Innovations, Inc. The resulting Inspections Manager application is a Microsoft Access-based query that automates the scheduling process to the push-button level, allowing an HACC supervisor to simply click on commands such as Get Mainframe Data and Create Inspection List. For more information, contact Dwight Fenderson, HACC (e-mail: dfenderson@thehacc.org, tel. : 312-542-4661).